A happy Lunar New Year to all who celebrate it! Enjoy collecting red packets and catching up with friends and family over the holiday. Meanwhile, Niantic have decided to release their first ever Lunar New Year event for us to enjoy, in between the visiting and festivities. From Feb. 4, 2019, at 1:00 p.m. PST (GMT −8) to Feb. 13, 2019, at 1:00 p.m. PST (GMT −8), trainers will have double xp from catching and evolving Pokemon as well as having an increased chance of obtaining Lucky Pokemon while trading. Personally I think Electabuzz should be swapped out for someone more cat like but people will want to evolve Electabuzz for that Electivire. This is a good time to use your Lucky Eggs when catching Pokemon to get quadruple the normal xp for catching. Do tell your friends and family who play, this is the opportune moment for those celebrating it to meet up and do some trades while also ringing in the New Year. Finally, the event also sees the debut of Shiny Spoink, so don’t hesitate to tap on every Spoink that spawns in case its a Shiny! Next postPokémon Go Friendship Event! Have a fun Lunar New Year! 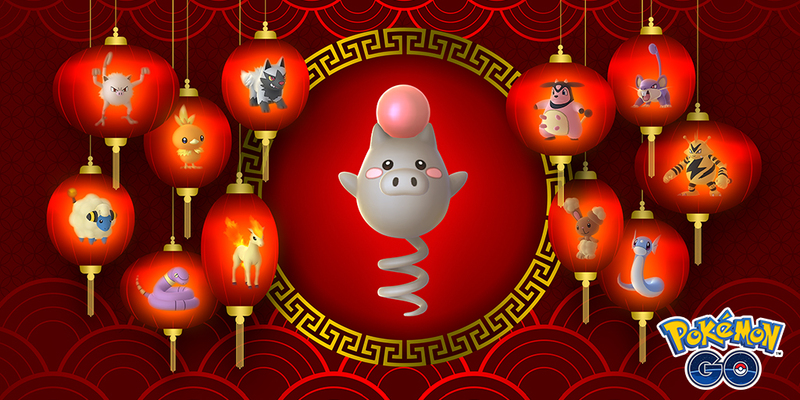 May you enjoy good health, prosperity and happiness in the year of the Spoink(Pig)😄 !